Just remember – when it comes to dental maintenance – it helps if you have something to maintain, and that starts with a professional cleaning, flossing and examination at Smile ConfiDENTAL. Call us to get started and we’ll show you how to brush your teeth – the right way! 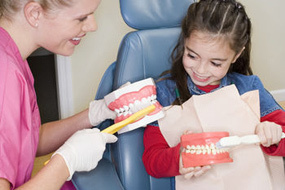 Remember, proper dental care starts with a periodic examination at Smile ConfiDENTAL. We’ll get your pearly white teeth cleaned, take any necessary x-rays and let you know the areas of your mouth that you need to concentrate on a bit more to prevent further tooth decay. We’ll also demonstrate proper brushing and flossing and answer any questions you might have.